The holy war between people who use Android and those who use iOS is one that really should have gone away by now, but all you have to do is browse any public smartphone forum to realize people really do still get their knickers in a twist about which platform they believe is the best. To prove the point that both Android and iOS have their positives and negatives we thought that we would put together a list of twelve – 12 – things that make iOS better than Android and in the interest of fairness, we’ve done the same to show why Android is better than iOS. We’re sure plenty of people will disagree with a few of these but that’s what makes the internet so great. Without the need to get updates OK’d by hardware makers who then slap their own cruft over the tap, Apple just pushes an update and watches as millions upon millions of people install it as soon as it is released for all supported devices. No waiting. That’s always going to be debatable, but the overall quality of iOS apps – compared to their Android counterparts – has always remained superior in terms of fluidity, performance and overall polish. This one’s a winner when compared to Android; Apple keeps on supporting its older hardware for an extended period of time, keeping things fresh for those who can’t afford to upgrade to the latest and greatest. Developers tend to go for iOS first before pushing their apps out on Android – in short: iOS gets the best apps first, followed by Android. When you look at iOS you have to take into account iTunes, the App Store, the iTunes Store and all of the other parts of Apple’s ecosystem like OS X, Apple TV, Watch OS, iCloud etc that amount to more than the sum of their parts. Apple’s iOS may be getting less user friendly with every update, but when compared to Android it’s a piece of cake to use, even for novices. Paying for things with your iPhone, or even your Apple Watch, never gets old. Apple Pay is fast becoming the most popular and the most used mobile payment option out there. With over 400 Apple Stores around the world, the Cupertino giant provides customer support for iOS devices like no other. Have a broken device and need a replacement? No problem. Want to set up email on your new device? Consider it done. And AppleCare is second to none. End of conversation. Being able to have everyone in one family use the same credit card and effectively share a bucket of apps is great, especially when you throw in the parental controls that come with it. Yeah, iOS has had its moments but you don’t see anywhere near the number of security scares on iOS that you do on Android. You can start a task on one device and pick up where you left off on another. And oh, you can even make or receive phone calls from your iPad or Mac too. What’s up, Android? A messaging platform unlike any other, iMessage is by far the most seamless IM/SMS experience out there. Period. Well, to a point at least. It’s certainly more open than iOS, that’s for sure, leaving it more accessible for changes by its users. One of Android’s biggest strengths is the lengths that people can go to when customizing how it works, and how it looks. Users have the option to use custom skins and themes to the nth degree. Want Android on a high-end smartphone? No problem. A low-end phone that costs next to nothing? You got it. Access to your files like a grown up. That should not be undersold and Android wins here over iOS by a huge margin. If you’ve ever tried to manage how a child uses your iPad or iPhone, then you’ll know why user accounts are so important. You’ll never run out of space to keep your videos on. Well, almost never. Most Android manufacturers support this feature. Running low on juice on that business trip? No problem, just swap out the battery. Just like expandable storage, this feature is supported by most Android device manufacturers. Because who doesn’t want to change the channel on their TV using their smartphone? Exactly. You can spend hours fiddling with Android, flashing ROM after ROM. Just be careful because once you pop, you just can’t stop. Perfect for squeezing that little bit of extra performance out of that already-powerful CPU. This one’s our personal favorite; you can download any file right from the Web browser on Android – be that a song, a video or a plain old document. A feature supported by most Android devices these days, you can get hours of battery life by just charging your gadget for a few minutes. There are plenty more reasons on both sides of the fence, but these are a good start as far as we’re concerned. We’re big fans of both Android and iOS though, so let’s all be adults and just get along. OK? Surprisingly no arguments here yet…. I’m sure plenty of jimmies got rustled with this article. was this article aimed at two and a half crips iFags who are still reading ApplePie? If you don’t like the blog then why read it? There are certainly other blogs that focus more on other news in the tech world so why not read them? Maybe AndroidAuthority or Gizmodo? Of the ways in which you describe how Android “beats” iOS, only access to the file system, multi-user accounts, and browser based downloads are at all meaningful. Multi-user accounts are really only applicable for tablets. I would never want to set up multiple accounts on my phone. Access to the file system and the ability to download files from the browser would be nice but they are far from show stoppers given the ubiquity of cloud file services. I’d also point out that iPhone 6 supports fast charging using the Apple 12W charger. So, Android has no advantage in this regard. The iOS advantages you discuss are real and valuable benefits. One iOS advantage that you fail to mention is that the UI of iOS is more responsive, more fluid, and more enjoyable to use day in day out. A lot of those Android advantages can be achieved on a jailbroken iDevice. Yeah,but that’s not made/allowed by Apple. I see no point to arguing here. You have to decide which is the one for you. 🙂 If I could use Viper4android app on iPhone I’d use my iPhone 5s even more. Both device is great though. Or listening Spotify without shuffle mode (without premium subscription). I can do it on my HTC One M8(rooted). That’s because nobody pays attention to him on the other tech blogs. I’ve used both platforms, for home and professional use. I like the fact that I connect additional devices to my android tablet (which I use to communicate with industrial devices) however the iOS platform is so much better of an experience. Everything on iOS works smoothly and easily. Granted Android does have it’s strengths, I prefer iOS. Not going to hate on Android, it’s different which is good. Competition is healthy, and without it there wouldn’t have been as many innovations as we’ve seen. Google Wallet hasn’t entirely been a success. You can’t say apple Pay is an advantage because Google wallet does the same thing except better. I can add my cards from other countries to Google wallet but not apple pay. The only reason apple pay seems bigger than google wallet is because of the marketing. The rest of the points I agree. As long as I can do it, why should I care if Apple likes it? True,but don’t forget the fact that Microsoft was the first who introduced the tablet first, and few years later Apple did the same. How about acceptance? Apple Pay was launched after Google Wallet but it got a lot more spotlight than the later… Just an opinion. The article is about to compare the operating systems in 12 Ways Apple’s OS Beats Google’s OS And Vice Versa. In untouched,factory condition. It’s not about what You can do with your jailbroken iPhone or rooted android phone. The article states “custom ROM’s” a point for android, which is achieved through root access, so you are mistaken good sir. Apple Pay is far more accepted/used. Google Wallet doesn’t keep your CC info sandboxed and inaccessible to malicsious apps, Google Wallet doesn’t give you credit card protections for your purchases, etc. My understanding is that more & more droids don’t have removable batteries, but I could be wrong about that. I know they’ve done away with micro SSD storage. Google Wallet doesn’t give you the CC purchase protection (Google Wallet charges your card, then they pay the NFC station). Credit Card numbers aren’t stored on sandboxed chip that is inaccessible to apps, etc. I think that direction is starting to reverse. I’m upgrading today from an LG G2 to a G4 and the G4 has both a removable battery and a micro-SD card slot (my G2 has neither). In fact, LG is currently running a promotion for a free 32GB card, extra battery and a standalone battery charger. And what do you think will happen if we root Android here in that case then? There’s HUGE benefits to having access to a file ON MY PHONE, as opposed to in the cloud! #1 is speed of access, especially if a data/wifi connection is null or slow. Besides, we all know the heights of security of the Apple Cloud now. That’s like…totally your opinion….bro. 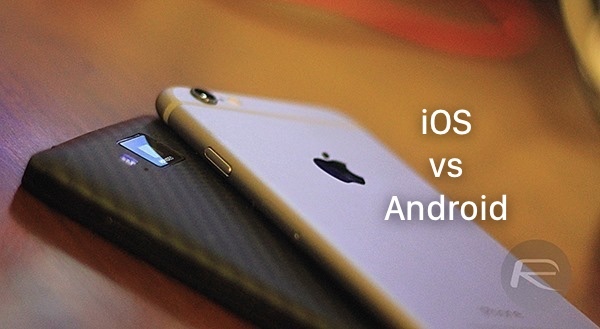 Tons of us prefer Andoid UI…very intuitive, and I’m a former power IOS user. All of the other benefits of Android u glazed over are also ur opinion. For example, my niece plays with my PHONE all the time–it’s not just ideal for tablets. And your 12w charger is and additional $25. $25 each for your home computer desk/lounge area, bedside, office….or do you carry it around with you lol. Apple’s great at charging you extra for what are standard experiences on Android. You’re right, a jailbroken iphone can do what an Android phone can do OOB lol. And as Tom-Helge said, what happens to this list comparison when you root an Android lol? Well to be fair, if you were to include “Jailbreaking” on the iPhone section it wouldn’t really matter since the advantages it brings are similar to what Android phones can do STANDARD. Since, you have to buy all those extra chargers anyhow, what’s the big deal about spending a few more bucks for 12 Watt chargers? Besides Apple chargers last for ever and are highly future proof. Your argument is a red herring. BTW, why do you need fast charging on your bedside table? You only sleep for 90 minutes before waking up and using your smartphone until the battery is completely drained?